Pre-race bib and shirt pickup will be available on Thursday 10/17 from 5:00 - 8:00pm at Road Runner Sports in Laguna Hills. Bibs can also be picked up on race morning. Check in and bib pick up for registered runners begins at 7:30 AM. Registration Fee: $50 for 5K and $60 for 12K. Location: Whiting Ranch Wilderness Park. Glenn Ranch Road Parking Lot at 27901 Glenn Ranch Rd., Trabuco Canyon. Parking in the Glenn Ranch lot is $3 cash. Our volunteers will be there to take payment for parking vouchers. 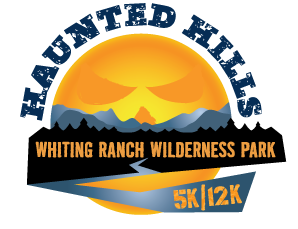 NOTE: Race may be rescheduled due to rain or muddy conditions, per OC Parks, and up to the discretion of OC Parks leadership and Whiting Ranch Rangers. If this happens, we will notify participants prior to race day.. Please note: We are paper cup-less. We provide water and sport drink at the start / finish and aid stations, but you must provide your own hydration pack or hydra pouch. This reduces waste and keeps the risk of trash on the trails to a minimum. Strollers are not allowed on either course. Whiting Ranch is a wilderness park, and as such, no dogs are allowed anywhere within the park, not even the parking lot. Register Here Haunted Hills OR for the entire Holiday Series!